Add vibrant color and artistry to your Fall fashion palette with a beautiful necklace from Designs by Cleo, a local favorite. 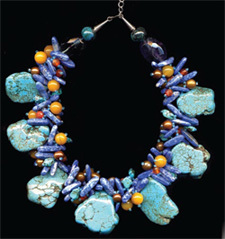 The pictured necklace features eye-catching turquoise, complemented with lapis, yellow jade and carnelian, and hints of gold freshwater pearls. For more art you can wear, visit designsbycleo.com or call Cleo at (843) 342-7001. 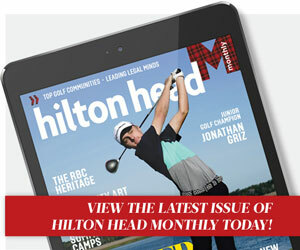 Hilton Head Island and the Lowcountry’s world-class companies, both new & enduring. With more than 250 restaurants to choose from, dining out on Hilton Head is as much a part of the island experience as the award-winning golf courses and pristine beaches. While having a high number of restaurants in such a small community leaves locals and tourists never lacking for variety, restaurant owners face one of the most competitive markets in the community. And while Red Fish has yet to celebrate its 10-year anniversary, we are thrilled that our other restaurants, Old Oyster Factory and Alexander’s, have both surpassed that milestone. Although you’ll find more complex recipes in our kitchens, our recipe for longevity is relatively simple – with maintaining our focus, striving to improve and community involvement being at the heart of our organization. Our pets deserve nothing less than the best and, to that point, Monthly has compiled a line-up of items we think animals and pet lovers will greatly appreciate. From enhanced bottled water to durable life jackets, for those long days on the boat, and chiffon collars that will make them the life of the party, your little fur ball is sure to enjoy any and all of these delightful products. Keep your four-legged friend cool in the hottest of weather. Simply add water and an absorbing polymer creates a soft gel-like mat that keeps cool despite rising body or room temperatures. Available in blue rectangle/bone or pink/oval heart styles. Visit trixieandpeanut.com for more details. To many of us, setting sail to chase the horizon for a few years may seem like an unattainable pipe dream. For the O’Grady family, it’s one of their most treasured memories. 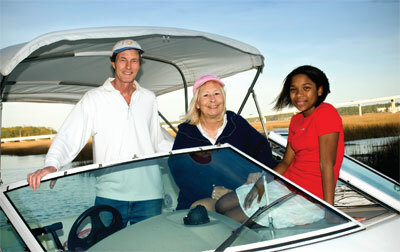 Will and Pamela O’Grady and their 13-year-old daughter Sara set off on a grand adventure on the seas on what’s known as “America’s Great Loop.” The O’Grady family covered the distance in stages over three years time, returning back home for seasonal breaks. All in all, they spent six months traveling, accomplishing what many of us yearn to do. 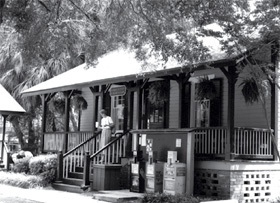 It was a fine day when they set off from their Hilton Head Island home in early June 2004. From Spanish Wells, they headed up the Intracoastal Waterway to the Chesapeake, up New York’s Hudson River to the Erie Canal and across Lake Ontario to Canada. 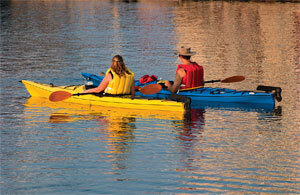 Many people who live in the Lowcountry agree that the single greatest attraction here is the water. Some are content just to look at it – they relish the simple pleasure of knowing that it’s there. 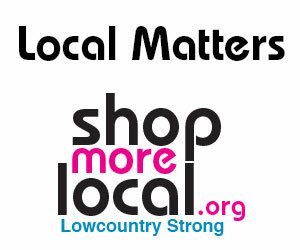 Others, however, enjoy getting out on the rivers, sea, sounds and tidal creeks that make this place what it is. If you belong to this second category, summer is here and there are plenty of boating adventures to be had. A good day on the water might involve a little fishing, a little cruising, a little swimming, some eating and drinking, maybe even a bit of sunbathing. If you keep your eyes peeled, you’re liable to see some of the spectacular local wildlife, such as dolphins, otters and bald eagles engaging in these same activities. Jim Stubbs brings the art of and science of sailing together. It’s hard to imagine a more exotic trade than the sail maker. He designs and builds a defining archetype, the very thing that gives the sailboat its name. The sailing vessel itself extends back in time through the millennia, carrying fishermen, cargo, explorers and settlers throughout the known and unknown parts of the world. And the vast majority of these ships depended upon their sails and the wind to get them to where they were going. Whether it was a simple fishing boat sailing the ancient Nile, captain James Cook’s square riggers slowly wending their way through the islands of Polynesia, or a sleek, new America’s Cup yacht plying a race course, every sailing ship requires a designer to develop an effective sail plan and a craftsman to build an efficient sail. 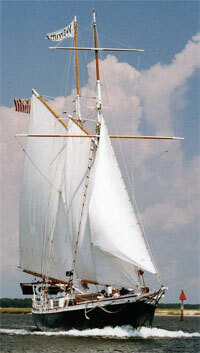 In the last century, the craft of sail-making has evolved into a thoroughly modern art and science. Nowadays sail makers tend to be few and far between, but it’s worth noting that Hilton Head Island has one to call its very own. Check out these practical and unforgettable presents for mom. From staying organized with a personalized recipe and entertaining journal to basking in a shiatsu massage, mom will love you even more than she already does! This innovative gift idea will allow moms to be more organized in the kitchen. The kit offers a home for recipe cards and journal pages for recording menus and guest lists. The three-ring binder format allows for even more organization and a kraft-paper envelope for recipes clipped from newspapers and magazines. It’s stain- and water-resistant too! For more information, williams-sonoma.com. 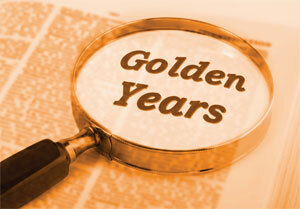 Editor’s Note: Monthly asked local writer and business consultant Jack Wilson (master of the “how not to retire’ philosophy) to provide a multi-faceted perspective regarding retirement. He interviewed a cross-section of locals who asked him to omit their last names. 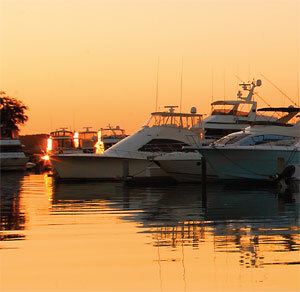 Fair weather and mild winters bring yachts to the waters of Hilton Head Island. It’s a rite of passage that occurs each spring and fall, those times of transition in weather highlighted by the slow, stately approach of yachts to the waters of Hilton Head Island. A few years ago, Barr retired as an IT specialist for a national electronics firm. Shortly after his last day at work, he and his wife Janet finally realized their dream of living and traveling aboard their sailboat, which they had painstakingly refitted. On their first extended passage, they set sail from their home port in North Carolina and headed south along the Eastern Seaboard for the Caribbean. Hurricane season had run its course, and it was finally safe to untie the dock lines. 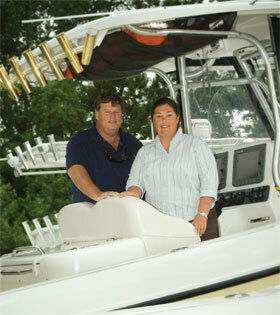 Local fishing family shares its passion for water sports with the Lowcountry. Charles Getsinger, a licensed charter boat captain and owner of the Hilton Head Boating Center, can’t remember the first fish he ever caught, or even the biggest. But that’s because as an avid fisherman and boater, he’s caught many big fish over the years, including sharks, blue marlin, cobia, and several other Lowcountry favorites. “We’ve caught everything there is to catch around here at one time or another,” said Getsinger, who regularly fishes with his wife and business partner, Sheri Getsinger. They have been fishing in the Hilton Head Island and Beaufort area all their lives. Charles grew up in Ridgeland, was a charter captain off of Hilton Head Island for 12 years, and guided hundreds of novice and experienced fishermen on excursions around the area’s numerous waterways.